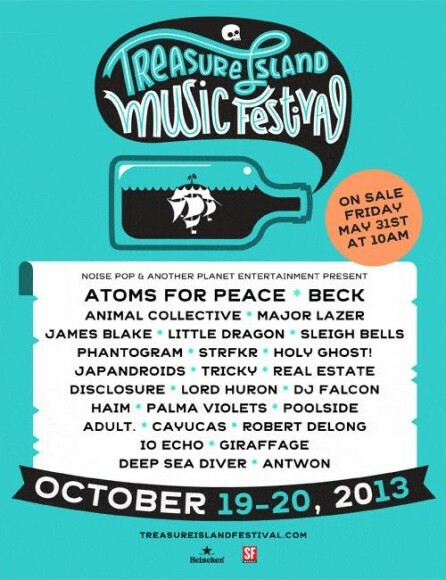 The San Francisco Bay Area’s annual Treasure Island Music Festival has announced it’s 2013 lineup. The two two day festival will include Little Dragon, James Blake, Sleigh Bells, and many more killer musicians. TIMF will take place October 19th and 20th just outside San Francisco proper for two days of music without any overlapping sets. For the last seven years it has provided concert-goers with a wide array of bands, food, and vendors, all taking place against the backdrop of the San Francisco skyline. For information on tickets, parking, etc., visit the festival website.